To establish infection, the virus must infect basal epithelial cells that are long lived or have stem cell–like properties. 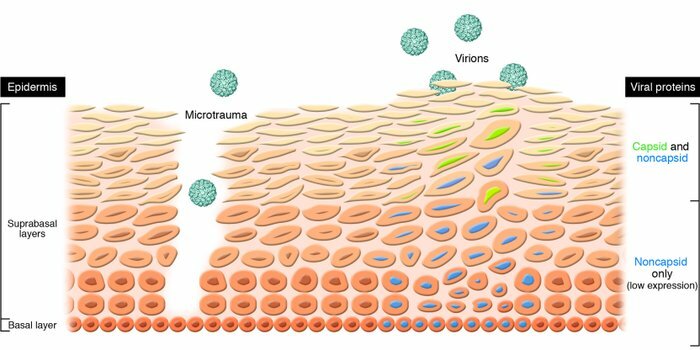 Microtrauma to the suprabasal epidermal cells probably enables the virus to infect the cell within the basal layer. The viral genome maintains itself as an episome in basal cells, where the viral genes are poorly expressed. Viral replication takes place in suprabasal layers and is tied to the epidermal differentiation process. The presence of the virus causes morphological abnormalities in the epithelium, including papillomatosis, parakeratosis, and koilocytosis. Progeny virus is released in desquamated ces.